Travel with Kevin and Ruth! : Palmetto State Park and Skydiving. So we vacated our site and went and parked at the day use area. Then we got the bikes off and went for a bike ride. We rode up to the overlook. And then some of the trails. We ended up doing about 8.5 miles (13.5 kms) on the bikes, then we went back and had some lunch and went and hiked the rest of the trails. It's fun on the bikes, but you actually see more when you're walking. This fellow blends in nicely. "If I don't move, they won't notice me". How long has this wheel been here? We drove out to the park headquarters to check and see if we could stay, but we had our doubts. Sure enough, they were full. But I saw this nice full hookup site beside the administration building. I asked if they could rent us that one. But the ranger said "oh, that's for the camp hosts and interns that we have during the summer". "So when do they start?" I asked. "Not until the beginning of May." he says. "Oh good, so since you're sold out you can rent me that one for tonight"
"No sorry, it's not in the reservation system". Hmph. Okay. There was no arguing to be done with that kind of logic, so we headed out. Yesterday's drive, 12 miles (19 kms). We drove up to the town of Luling, but it seemed really busy with traffic. I had seen a little airport on Google Maps just north of town so we drove up there. The parking lot was fine, but the airport seems to be only used by a skydiving school. I went to the office and asked if we could stay the night in their parking lot. The boss came and spoke to us and said that the parking lot actually belongs to the city and we would probably be asked to leave at some point during the night. "But," he said, pointing to a big hangar building, "you can go up and park beside that big old building and they won't bother you up there". And so we spent the rest of the afternoon watching the skydivers doing their thing. This place actually takes you up to 14,000 ft so you can do a full one minute free fall. But, they want $189 USD ($258 CAD) for the privilege so we took a pass on that... for now. Would definitely like to do that some day though! "Hey, look at that one!" Some of these guys and girls were really good. They would come zooming down and at the last minute land nice and smoothly. The equipment sure has changed. The parachute backpack is tiny and very light weight. 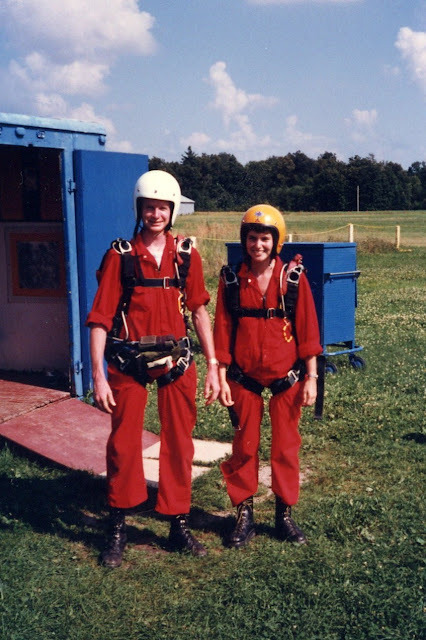 Quite a difference from the time Ruth and I jumped out of a perfectly good airplane back in 1987! Ready to jump, July 25, 1987! And so, we had a free overnight spot with some free entertainment. Thanks to Skydive Lone Star for letting us stay! Today, we're headed to Lockhart State Park for a two night stay. Camco RV Holding Tank Treatment. On sale, plus there is a 15% coupon showing on the product page. I love that picture of you two young kids lol. Lol, it is definitely a fun one of us! I can't believe how young we looked back then. Yep, we sure were and things still haven't changed, lol! Haha. That is a great picture of you two skydivers! As are those park pics. Is that Texas or Costa Rica? Total jungle! Have a great weekend and I'm just looking forward to Australia. Cheers and happy Easter! Thanks Scott, it's hard to believe that we did that almost 32 years ago! Palmetto State Park is definitely a pretty park. We love all the lush green plant life and yes, when you are walking through parts of the park it is very jungly like. Cool pics especially of you two in 1987.. well done! Kevin has all our photos on his computer. We do have lots of photos but we go through them at the end of each day and only keep the good ones. We also have a hard drive that we keep a copy on, as well as a thumb drive. So hopefully we will never lose all our photos. We have the photos classified under the year, month and day and each photo is labelled as to where it is and any pertinent info, and then I also put descriptive tags on them, such as country, wildlife, birds, waterfalls, sunsets and sunrises, family etc.